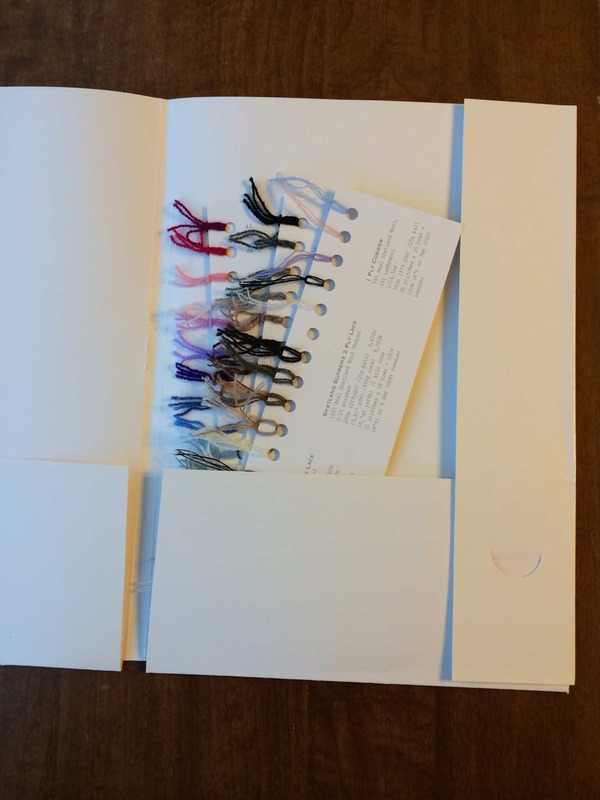 Before I left for Baltimore, I ordered a Jamieson & Smith color card for their lace weight yarns. I have this fantasy of knitting a traditional wedding shawl using the Jamieson & Smith Shetland yarns. The color cards came while I was away. I have never ordered a yarn color card before. Opening the envelope and taking out the cards is like opening a Christmas present without losing the thrill of anticipation. The innocent little wisps of yarn represent so many possibilities and the opportunity to plan! I originally ordered the cards because a friend of mine is in a serious relationship that I expect to turn into an engagement in the not-too-distant future. I told her I would knit her a wedding shawl; this freaked her out a little, as she seems less certain of the engagement possibility than do all observers of the relationship. 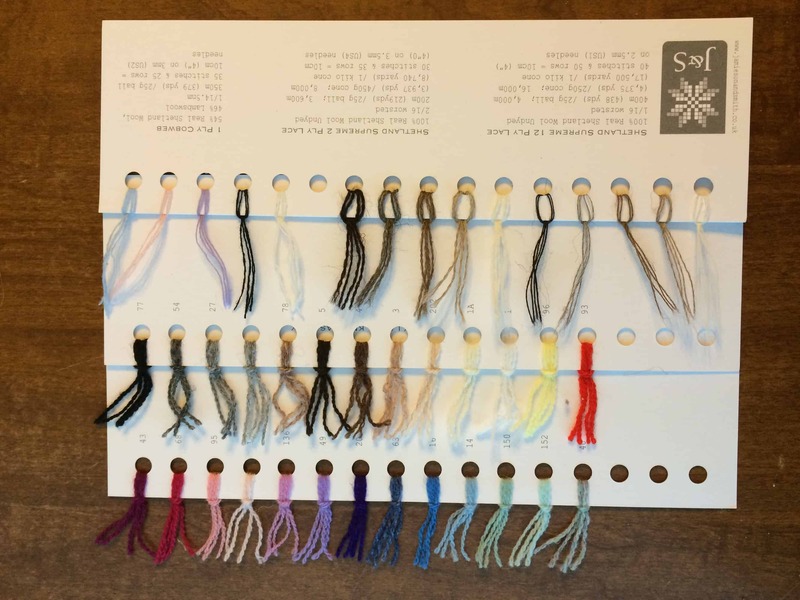 I stopped talking about wedding shawls because of her reaction, but ordered the color cards. I didn’t know how long it would take to get them in from the UK (answer: less than a week! ), and I do want to knit a wedding ring shawl, even if it isn’t for someone’s wedding. A “wedding ring shawl” is so named because it is knit with yarn so fine that, no matter how large of a shawl you knit, you can pass it through a wedding ring with ease. I went looking on YouTube for a video of a shawl passing through a wedding ring and found this fantastic 15-minute long documentary, Shetland Fine Lace, commissioned by the Shetland Museum and Archives. At 3:48, there is video of a shawl passing through a wedding ring. While I was in Baltimore, I learned that one of my cousins has set a wedding date. He and his girlfriend have been together for nearly 10 years, and engaged for at least two, but have never set a date. I also learned that it seems likely that two of my other cousins will be engaged in the next year. Perhaps I will have the opportunity to knit several traditional wedding shawls in the next 12 to 18 months! I am going to start a Pinterest board for wedding shawls. 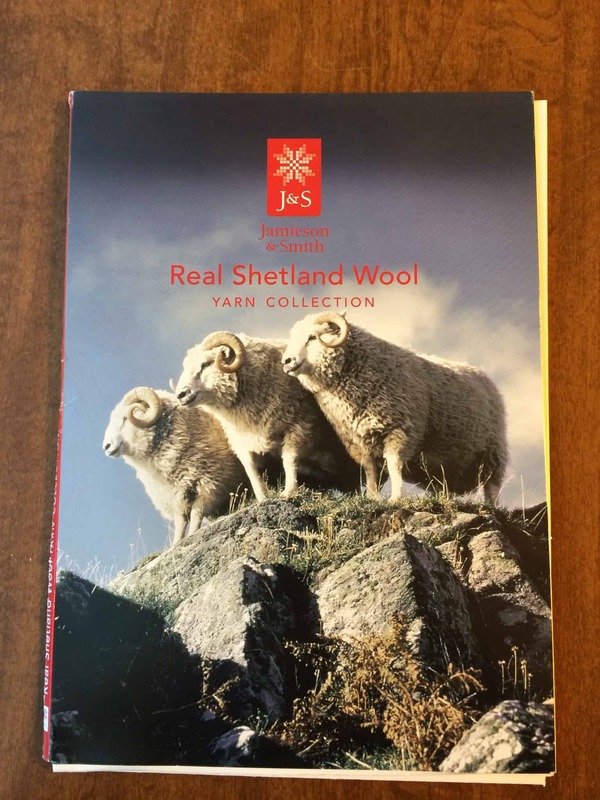 I am looking for a wide variety of shawls, not necessarily just Shetland patterns. I’d like to find examples in all the different shawl shapes and using a wide variety of patterns. I do plan to use the 1 ply Jamieson & Smith yarn (the top card in the picture below) if and when I knit a shawl. If you come across anything awesome, drop me a comment so I can add it to my Pinterest! When I’ve built up a bit of a collection, I will share the Pinterest board on my blog.